Megamind had the dubious honor of being the second animated film released in 2010 to focus largely on the exploits of a supervillian who reforms his ways. Subsequently, there’s an air of familiarity to the narrative, but unlike Despicable Me, I found Megamind’s efforts to be genuine. Despicable Me’s attempts at forced sentimentality and cuteness were overwhelming, but with Megamind, there’s an added level of importance placed on building the narrative around superhero tropes. Such is the case, Megamind recalls the superman ideology with its own sense of humor. Megamind (Will Farrell) and Metro Man (Brad Pitt) arrived to Earth at the same time. Products of their environments, Megamind was brought up by convicts, whereas Metro Man had a traditional family upbringing. The two form a heated rivalry, with Metro Man always gaining the upper hand. But like clockwork, Megamind escapes confinement and seeks to destroy Metro Man once and for all. Most unexpectedly, he succeeds. This proves to be more trouble than it’s worth, as the proverbial ying is absent from Megamind’s yang. McGrath’s sense of scale is quite admirable, as action sequences flow seamlessly through the massive streets of Metro City. Despite its technical accomplishments, there’s no flow between action sequences and the narrative itself. It’s as if the action sequences serve as placeholders for any narrative build, which is a shame, because Megamind has ideas in place that, if executed properly, could have really made for some sweeping emotional moments. The seedlings were there with Megamind’s relationship with his best friend Minion (David Cross). The two exchange cute banter that never becomes too precious, with the inevitable disintegration between them coming across as authentic. 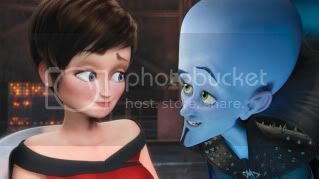 The same can be said in regards to Megamind’s relationship with reporter Roxanne Ritchie (Tina Fay). Their relationship opens something in both of their characters that really makes you sense a development in personality and spirit. But, again, they’re relationship has an unconvincing narrative resolution. Megamind’s dependence on action sequences to push forward the narrative simply doesn’t work, even if the action sequences in itself is impressive.